FANBOY PLANET.com . : mc-disneymarvelanalysis :. Prepare for the new order. From the moment that Avi Arad and Ike Perlmutter began making their move on Marvel in the nineties, Arad made it clear that he thought they were the 21st Century Disney. So as of today he turns out to be half-right, as his former partner Perlmutter has spearheaded a deal to simply become Disney. Arad left Marvel a few years ago to become an independent film producer, though it's likely he still has some stake in the company. As does someone else - the man who brought Marvel to prominence in the first place: Stan Lee. And guess what company he's been working for over the past few months on a little project called Stan Lee's Time Jumper? Disney. Interesting. They're all coming home to roost, in a deal that makes sense on Wall Street. There's no way Marvel stockholders aren't going to approve this, as the immediate result of the announcement was a 25% jump in the stock price. It has a lot of fans nervous and skeptical. (Admittedly, that's from a random sampling of Facebook and Twitter responses this morning, but I'll stand by it.) On his Twitter feed this morning Marvel staffer C.B. 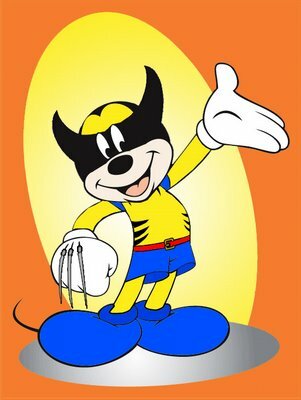 Cebulski assured fans that this was "like when Disney bought Pixar… everything Marvel stays as is." Fine, except that in the Disney/Pixar merger, things didn't stay as is for the rank and file at Disney. And Cebulski also followed up by telling contracted freelancers to call with any questions, and commenting again that it looks very good for Marvel. Vote with your wallet, people -- prove Boom! viable. But what about for the fans? What are the potential ramifications? Let's take some consideration here. At the recently concluded press conference, no one brought up Boom! Studios and their deal to publish Pixar and Muppet books, which was believed to be on track to expand into classic Disney properties. Obviously, a contract is involved, and when it expires in a year or two, Marvel could wind up doing The Incredibles. On the plus side for the next generation of readers, a Disney/Marvel combination means a lot more serious effort being made to do comics for kids. Boom! has done a great job getting the ball rolling, but the reality is that to a lot of people who don't read comics, Marvel Comics are all there are. Possible loss for Boom! Studios, and for consumers - their kids line rocks. However, as comics readers we may stop living a Children of Men scenario. In addition, Disney had been working on their own graphic novel imprint, Kingdom Comics, headed by Ahmet Zappa and Christian Beranek. This could easily become an imprint under Marvel without necessarily costing anybody their jobs. No impact for consumers - unless you really hate this deal. No longer in Disney's sights -- now a resident of Duckburg. 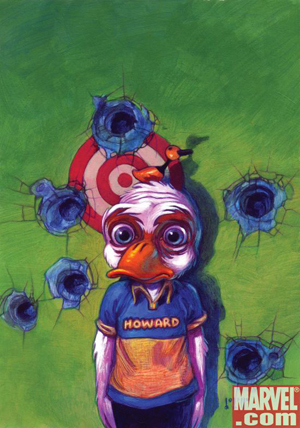 Marvel was once vaguely threatened by Disney over the appearance of Howard the Duck. Before any action could be taken - and no one seems to know for sure if Disney intended to do so - Marvel lawyers instructed that changes be made to Howard's appearance. Lampooned in the black and white Howard the Duck magazine and then ripped apart when Steve Gerber returned to the character, Howard never quite seemed the same when he was forced into looking less like a beloved animated icon. Now he could return to his original appearance and move out of Cleveland and into Duckburg. Call this a win for those of us with twisted sensibilities. 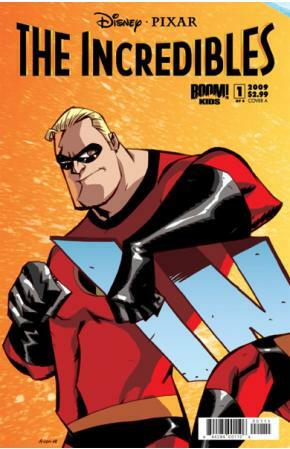 Disney now owns Marvelman. They may now be publishing work by Alan Moore. This brings a whole new meaning to "the Magic Kingdom." Just saying. Marvel still has five pictures to go in their contract with Paramount, and technically they had become their own production entity anyway. 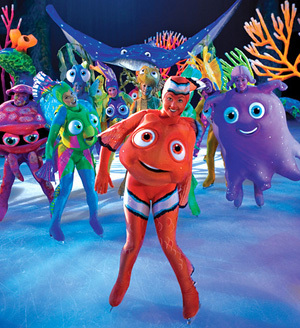 Disney wants those movie rights - but we're not going to see any impact until 2012. And then it's all over anyway, right? Sony, however, recently announced that they had contracted a screenwriter for Spider-Man 5 and 6, with an eye toward rebooting the franchise with a younger actor in case Tobey Maguire balks. We are not going to see a cinematic teaming of Spider-Man and Tron facing off against Arcade any time soon. Having written that just now, I really want to see it.A loss for fans and for stockholders. In addition to Spider-Man: Turn Off The Dark potentially being back on, I have just three words for you: Inhumans On Ice. Disney XD shows a lot of Marvel animation. This one's a no-brainer, as thanks to a strange deal years ago involving the purchase of Fox Family channel, Disney already holds the rights to the better Marvel animated series - including the 90's Spider-Man and X-Men shows. (Warner has the lamest one -- X-Men: Evolution.) No major impact to fans. Now Marvel has a direct line to ABC, which means that maybe they can start making inroads to live-action series television in the way that DC has been doing with shows like Smallville, Human Target, Birds of Prey and the in development Fables and Midnight, Mass. Fan win, unless it's a lot of shows like Birds of Prey. Universal already has a Marvel Island of Adventure in Florida, and some of the characters walk around Universal Studios in Hollywood. Everything here veers even more into the realm of pure speculation, though obviously Disney wants Marvel characters in their parks. In the Pixar deal, John Lasseter didn't just get made head of animation - he's also in charge of theme park attractions. My guess is that Disneylands and the Magic Kingdom in Orlando will largely stay Marvel free, but here in California, we have a little park next to Disneyland that desperately needs reasons for people to attend. Even though Lasseter has jumpstarted California Adventure attendance with things like Turtle Talk with Crush, Mike and Sulley to the Rescue and Toy Story Mania 3-D, a combination of Pixar and Marvel could finally make it a park to truly be reckoned with. What's to keep Disney from installing their own Spider-Man the Ride like in Islands of Adventure? By many accounts, this is one of the best immersive interactive rides around, and it currently has no West Coast counterpart. Universal dropped the ball on this one with their Hollywood park, so maybe Disney could have at it. I call this a win for consumers of theme park goodness, and a temptation for Michael Goodson to actually be a good father and take his children to Disneyland. The other theme park thing on the horizon is that Lasseter has allegedly pushed the Imagineers to a whole new level of excellence with their audio-animatronics (aka "the robot characters"), which we'll be seeing first in a new CARS attraction. (The Ric Ocasek figure is far more lifelike than the real thing.) What this means for Marvel fans is we could see the more out there figures in astonishing reality in a theme park attraction, and there's no way that's not a win for fandom! Also, Spider-Man Mouse Ears. 'nuff said. I've read some things about what Lasseter, noted toy fan, is doing for Toy Story 3, and I want to see that applied to Marvel characters. Let's not speculate much here, because like everything else, Marvel already has contracts with a different toy company (and not the one they already own - Toy Biz) to produce figures and toys. I'm willing to bet that we are going to see a lot of Disney characters in Marvel costumes available for purchase in the parks, like the Disney Star Wars figures and Muppet Star Wars figures. Trust me, though - it's going to be a win.